Corner shower enclosures are very similar to quadrant enclosures. However, quadrants are rounded, corner enclosures go for a straight edged look which makes for cleaner lines and provides much neater look in the bathroom. The style of enclosures is one of the most compatible with bathrooms as it will fit in virtually any corner assuming there is enough room. 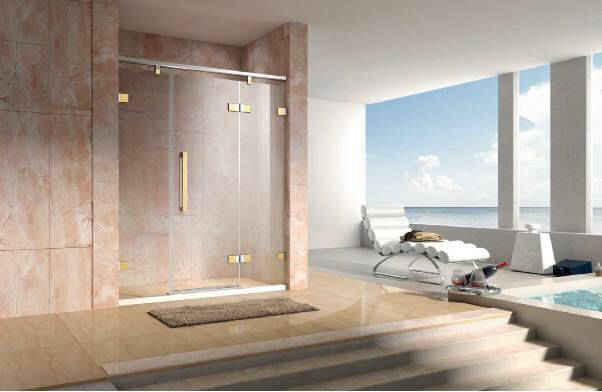 The straight line design provides much greater showering area than many other similar model enclosures. The doors are similarly fashioned to quadrant enclosures in which they are often centered and slide to either side; thus creating a generous entry area to get in and out of the shower. With all shower enclosures and doors featuring toughened safety glass, you can be assured that safety and durability were prime factors in the manufacturing process. We are always going the extra mile at Dabbl to ensure you get the very best value for money on your purchases. Like pretty much everything else you’ve bought for the bathroom, you first have to carefully consider the following; available space, dimensions and styling. Assuming you have the available space you require for a corner entry enclosure, you can begin measuring up the area to attain the dimensions. With these dimensions in hand you can work out what enclosures in our range will fit your bathroom. After you have settled upon a suitable size, you can start looking at corner shower enclosures that will suit the look of your bathroom. We have a wide variety of different styled enclosures in stock at Dabbl to give you the widest variety of choice possible.